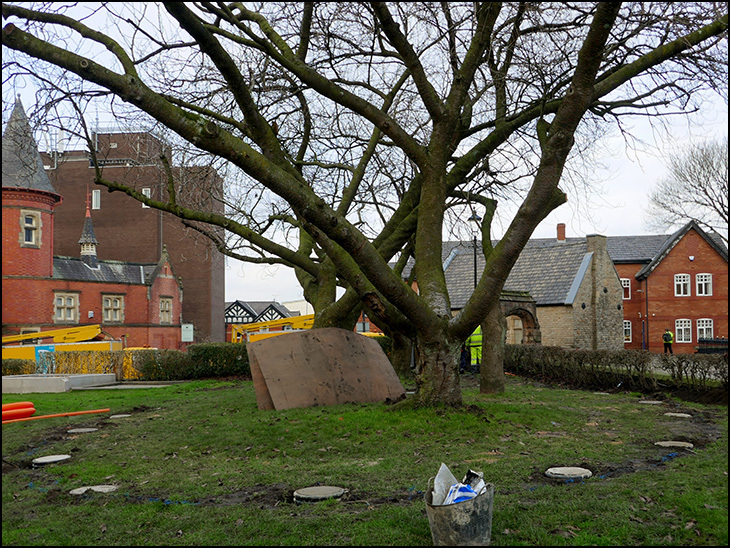 ...being installed in the grounds of Wigan Parish Church. A cool and damp photo Mick. But what are "Uplighters". Is this a new word? Julie, Happy new year x.
I'll go for ground lights, different colours. Your mention of 'the tradesman' in your kind and sensible reply to Ken's query reminded me of the occasion when the lights at Birmingham City's? ground had failed. The reporter sitting beside Alf Ramsey ('he was known for his short replies, and not just for '66') enquired as to how long it would take to repair the lights, to which Ramsey replied " I'm not an electrician." And That was That. Uplighters? though. I'm going for The Blossom Footlights, as it would sound more inviting to those seeking directions to the said display . . . I guess. Regards. Wonder if that is the plague burial pit and if they know? "Uplighters" In the war we had lights that shone up but they were called searchlights. Is there some secret code going around -Garry---Garry---Garry??? They must be in love Ken! Who pays the electricity bill? Just another way of lighting up the sky so we can't see the stars. Our streets around Wigan are as dark as the last war ,they say it's to be more econnomical but then low and behold we then see the money we save on or streets of dark and gloom being spent on useless rubish like these , who's bright idea was this.